Are you considering filing for Chapter 7 bankruptcy? At Wood & Brewer, LLC, our Columbus Chapter 7 bankruptcy attorneys have more than 15 years of experience helping individuals get through their financial hardships. We know how difficult it is to endure seemingly insurmountable debt—the stress, the constant calls from debt collectors. Our goal is to guide you through the process so you can achieve financial freedom, start fresh, and continue living your life with hope for the future. Begin Today When You Call (614) 410-6878! Chapter 7 allows you to eliminate a number of your debts by liquidating your non-exempt assets. Essentially, except for a few vital items, you use your assets (belongings, property, etc.) to rid yourself of as much debt as possible, then discharge unpaid debt. For people who have an irregular income or a high amount of necessary expenses, Chapter 7 allows them the chance to have a fresh start. Our firm fully understands the process and we will educate you regarding your specific situation so you can make informed decisions moving forward. When it comes to your finances, we know how important it is to trust the attorney you hire. Because of this, we make it a point to never pass you through inexperienced associates or a network of paralegals. Why Our Westerville Bankruptcy Attorneys? As bankruptcy attorneys, we’ve heard hundreds of people express their genuine sadness and despair for their situations. No one sets out to be caught in debt, but the unexpected can happen. We understand that. Our role is to provide you with clarity, peace-of-mind, and a creative solution to your issue. Because we have handled hundreds of cases just like yours, our attorneys know what you need—more importantly, we know what it takes to free yourself from debt and start with a clean slate. 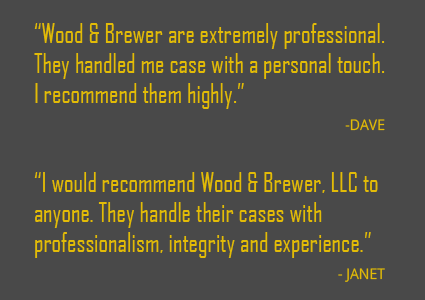 At Wood & Brewer, we are passionate about helping people start again. The mission of our bankruptcy firm is to allow everyone in Columbus the opportunity to take the reins of their life, conquer their debts, and wipe the slate clean. As lawyers, we accomplish this in the best way we know: with the law. From the moment we take your case, we will provide you with direct access to your attorney so you can ensure your questions are heard and your concerns are addressed. This also us to gain a full understanding of your case so we can help determine the best course of action for your situation. You can count on our Columbus bankruptcy lawyers to put our best foot forward in your case.